I'd thought I'd share this story with you all. 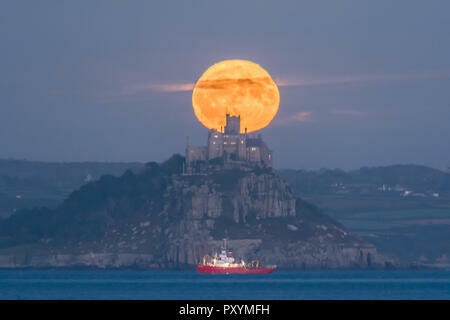 I took several pictures of the full moon coming up behind St Michaels Mount in Cornwall last year. This one I uploaded as was, and then with a crop as I thought the ship spoiled the picture. As well as putting out with Alamy live news I also sometimes tweet my pics and sell to the local papers. The WMN put the picture on the whole of the front page including the ship. Shortly afterwards I had people emailing me asking to buy prints - all were related to the boat in some way, either the owners, crew etc. All I ever remove are dust spots, stray tree branches protruding into the frame, birds and the like. Personally, I'm not a fan of manipulating editorial images. In fact, I find it scary. When I first looked at it, I thought the boat makes the picture and wouldn't have considered cropping it out. I think that the fact that the moon, castle (Church?) and boat are in alignment, and the contrast of colours of the yellow moon and red boat make the image interesting. If you remove the boat then it becomes one of millions of photos of just the full moon. I..... I thought the ship spoiled the picture. I agree. Sure for sales and general human interest, the ship is the main feature. But personally, I dislike things that are manmade. Buildings, streets, automobiles, contrails, people, and yes, ships ..... I think they are ugly and distracting. I don't want these things in my photos, because to me, photography is about showcasing the things that I think are beautiful, and only nature (devoid of man's presence) is beautiful to me. So the way I would've shot this would be much tighter, with just the moon, the sky immediately around it, and the very top of the ridges on the horizon (the part of the ridge top that doesn't have any lights or buildings in it).